In previous Mainstream Pokemon Games, all Pokemon had Levels. The higher a Pokemon's Level, the stronger they will be. 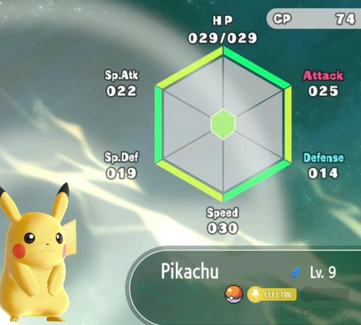 But in Pokemon: Let's Go, Pikachu, however, all Pokemon now have Levels along with Combat Points. If you aren't aware, Combat Points are a concept first introduced in Pokemon GO. Similar to Levels, the higher Combat Points a Pokemon has, the stronger they will be. Unlike Levels, however, Combat Points are determined by a Pokemon's Stats and Individual Values, proving all the more so how strong they truly are.